Late last year, when most people were getting ready for the holidays, physicists at the Large Hadron Collider (LHC) machine at CERN, the European Organization for Nuclear Research, made a startling announcement: their two massive detectors had identified a small bump in the data with an energy level of about 750 GeV. This level is about six times larger than the energy associated with the Higgs particle. (To go from energy to mass divide the energy by the square of the speed of light.) For comparison, the mass of a proton, the particle that makes the nuclei of all atoms in nature, is about 1 GeV. The Higgs is heavy — and this new bump, if associated with a new particle, would be really heavy. The high energy physics community answered with verve. In a few months, hundreds of papers have been published with hypothetical explanations for the bump. Last month, physicists at CERN released a bit more information, slightly strengthening their claim for the reality of this new data point. Right now, the bump has a 1 in 20 chance of being just a spurious statistical fluctuation, something that happens from time-to-time, even if rare. When do scientists declare that something is "real," that is, that something belongs to the collection of other particles we have found so far that make up all the material diversity we see? It's a tricky question. There is an agreed standard, that the signal for a new particle must be certain to a level of 1/3,500,000. That's very far from 1/20, and that's why physicists are not announcing a new discovery just yet. However, if all goes well with the LHC operations, by late fall we should have enough data to decide whether the bump is real. Then comes the fun part: If it's real, what is it? The editors of the prestigious physics journal Physical Review Letters published an editorial explaining how they selected four representative papers from the deluge they received trying to make sense of the bump. The exciting part of this is that the bump would be new, surprising physics, beyond expectations. There's nothing more interesting for a scientist than to have the unexpected show up, as if nature is trying to nudge us to look in a different direction. One paper suggests the existence of a new force of nature, so, a fifth force, that acts like the strong force that glues atomic nuclei together. The strong force also glues quarks into protons and quarks and antiquarks into pions. (I know, it starts getting weird quickly. Antiquarks? They are mostly like quarks but with opposite electric charge.) The idea is that these two quark-like particles are glued into something like a new pion (which looks a lot like a very heavy Higgs) that eventually decays, releasing the two photons that were detected. A new Higgs-like particle that couples to new kinds of particles. 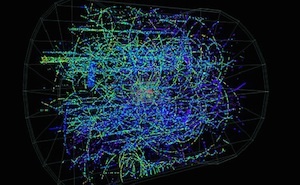 A particle predicted from a thus far elusive symmetry of nature known as supersymmetry. If real, supersymmetry demands that every particle has a partner, like a mirror image with some properties reversed. The simplest version of supersymmetry is practically ruled out by data, but more convoluted extensions are still game. Expectations are high that this could be the case, as supersymmetry has been around for more than 45 years and needs some experimental support to remain credible as a physical theory of nature — and not just a nice idea. Finally, the fourth paper suggests the bump is not the signature of a new particle at 750 GeV, but the remains of a much heavier particle that breaks down into a cascade of fragments. The two photons are the detectable signature of one fragment, like catching a movie in the middle. It will be interesting to see how this plot unfolds as new data is gathered and released to the community. The exciting part is that we have this amazing tool that is opening windows into completely new territory. The Higgs was just the beginning, it seems. Why should one care? There are different reasons, from the practical to the sublime. To engineer a machine like the LHC, compile and analyze the mountains of data it generates, and then interpret the whole thing takes not just pushing technology to the limit and beyond, but also the development of community rules of engagement in teams of thousands of physicists and engineers. Who calls the shots? How are decisions made? The World Wide Web was created at CERN to facilitate the exchange of data between scientists, a pretty critical spinoff from a particle physics experiment. Data storage and management technologies are being invented all the time at such facilities, as are detector and radiation technologies. At the more abstract, a new physics event at energies six times higher than where the Higgs was found would mean that we are edging a bit closer to the Big Bang, the event that marks the origin of the universe. There is a huge gap in energy between the Higgs and the Big Bang, of course, but getting new data at higher energies can clarify how to move closer. This kind of fundamental physics has a very noble heritage, as it traces its origins to the beginnings of Western philosophy and even beyond — to questions related to our origins. If we picture creation as a puzzle, every new piece we discover helps us understand our origins a little better. The new bump may not give us a final answer (it's not clear we can ever get there), but it'd certainly make the picture clearer. As Tom Stoppard wrote in his play Arcadia, it is wanting to know that makes us matter. And fundamental physics is all about wanting to know.